Living in Louisville, KY, is something that most of us love. It’s thrilling to live among the most populated areas in the country while celebrating historic landmarks. One thing that is seldom a cause for celebration is the choices in professional lawn care services. Many landscape companies in the area fail to achieve the level of quality that you hoped that they would. Worst still is the higher pricing that they charge, considering that they do little more than cut your grass. How can you find a better-quality service without spending too much? The answer for most homeowners in our community is still calling Lawn Works for their houses’ best yard care needs. Whatever your grass, trees, plants, and soil need to remain at peak performance, you need us assist you. Call us when you need a better choice for all your lawn care solutions. Since 2015, we’ve been making the most of any yard with the best range of service. Whatever areas your yard is lacking, our top landscaping professionals have the ideal solution each time. We have the experience you need for the best results possible, no matter what type of job you have. Choose our team today when you need a better option for professional lawn care needs. 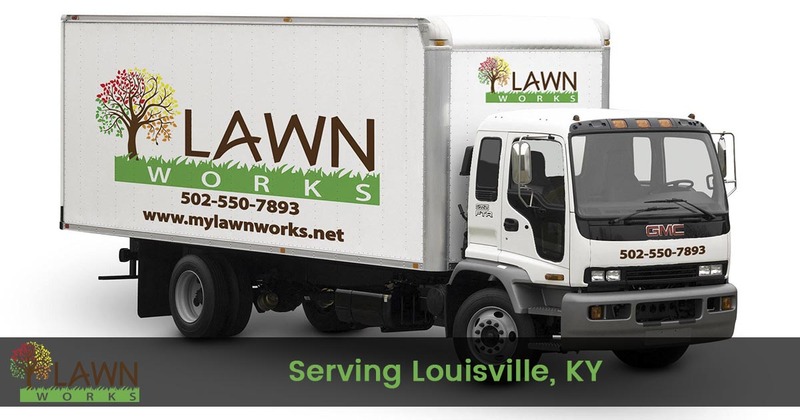 Call us to see why so many area homeowners trust us with their lawns! And many more choices for your best yard! There’s a reason why we’re still the number one choice in professional lawn care services. Call us today and discover how we can make your lawns perfect in no time at all! So many happy homeowners can’t be wrong. Choose the number one provider for all your landscaping needs! Louisville is a huge community, and you need someone who has what it takes to provide better service throughout the city. For several years, we’ve been assisting homeowners throughout the area, as well as the surrounding communities, to achieve their perfect yards. Our landscaping professionals have the experience you can trust for better monthly services, as well as professional designs and installations. Before you call an expensive niche architect or pricey landscaping companies, we can save you more on better services each time! No matter the scope of your work or the type of lawn care that you need, our team offers it all. Contact us for the best options for complete yard care! If you’re ready to experience the top name in local lawn care services, then contact us and request your initial consultation. Let us assist you to create your ideal outdoor spaces at a lower cost than anyone else. For the best mix of value, experience, and service options, you won’t find anyone better than our team. Call us now and enjoy better-quality lawn care.